Why do estimates vary so widely between contractors? When will you start my project? What are the benefits of priming wood before painting it? Why do exterior paint jobs peel? What are the best paints? Why do so many new houses' trim paint fail? What type of wood products do you use to replace exterior damaged trim? I have a Massachusetts General Contractor's license #CS81242. It is also referred to as a Construction Supervisor's license. I have an unrestricted license, which permits me to supervise other contractors who are engaged in construction, reconstruction, alteration, repair, removal or demolition of buildings containing less than 35,000 cubic feet of enclosed space. I am always on site at all jobs and perform the majority, if not all, of the work. If the job is very large, I may hire additional skilled craftsmen to assist me. I make all of the decisions regarding what work needs to be done, how it will be done and the materials I will use, according to your desires and goals. Labor is the biggest portion of a job's cost. The price depends on the expertise of the contractor; the surface conditions - the amount of surface preparation and repairs that are needed; attention to detail and the level of quality you desire. Experience has taught me that the extra time I spend on proper surface preparation and attention to every detail is well worth the effort and provides the longest lasting results. I also use the highest quality products that meet my high standards of beauty and durability. I offer competitive rates, which vary depending on the services you need. Please contact me for a free consultation and a written estimate for your project. I schedule projects on a first-come, first-served basis. At our initial consultation, I can give you a better idea of when I can start your project. The duration of your project depends on it's scope and any issues I discover while working on it. If the job is extensive, it may take several weeks to complete. I will outline this in the estimate. If any additional work needs to be done, I will review it and the costs with you and ask for your approval before I start it. Primers seal the surface and give the finish paint something to hold onto. They are useful for metal and bare or repaired wood, and when changing finish colors that are much darker or lighter than the existing color. They are also used to block all types of stains that would normally bleed through a finish coat. They provide a much longer lasting result than finish paint alone and are worth the extra time and effort. Moisture is usually the problem. When the sun heats the surface, moisture is drawn out and tries to vent out to the air anyway it can. If there are no vents or gaps provided for the house to breathe, the moisture will want to come out through the paint. Latex paints allow for a small amount of this. Oil paints do not, in general. Another cause for peeling is poor preparation. In order for a paint job to stand up to New England weather, you need. dry, sound wood that is not too smooth. The smooth side out of a clapboard needs to be scuffed with 80 or 100 grit sandpaper so the primer can penetrate and have an anchor profile to grab onto. Slow dry oil primer on all bare spots or weak areas . If the paint is cracked or split and shows signs that it may fail in the near future, even though it is currently sound, then I recommend spot priming that area. If you have knots, then I use Bin Stain Killer followed by an oil primer which is then topcoated with your finish. You must cover the Bin with oil primer or it will pop out because Bin does not have the strength to hold back the knot bleed itself. Caulk all open seams. I use Dap Alex Ultra because there is no sense in skimping on materials when that is 15% or less of the job cost and can add years to the life of the paint job. To keep water out, I putty holes and caulk open grained areas or replace such wood. If water can find its way behind your paint job, it won't last long. I prefer Duration for exterior paint jobs. It is thick and long lasting, which can make it hard to work with towards the end of a day, but the results are worth it. I can look at paint jobs 5 or more years old that are holding up very nicely. That can be expected if you've had your house prepped properly. This preparation work can easily be 60% to 80% of the time spent on the job. For latex exterior stain, I prefer Woodscapes. It's tough, sticks like crazy and dries to a flat finish. For exterior oil stain, I think Cabots Weathering Stain is the top choice here. This is for unpainted shingles or recoating an existing oil stain job. The sodium hypochlorite (bleach) in the product retards mildew growth. The fact that it is a penetrating product and not a surface one is ideal for shingles. Interior Paints. Duration Home by Sherwin Williams is quite good here, too. Coverage is excellent and it spreads nicely. I'm also fond of Muralo Ceramic paints. You can actually hear the difference between this and other paints, when you run a patching knife over it. The micro encapsulated ceramic particles make a sound as if you patched something very hard. 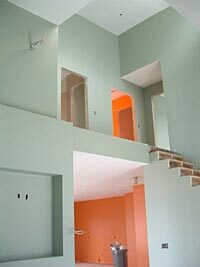 I'm also fine with Ben Moore Paints for all interior applications and do most commonly use Muresco for ceilings. Aquaglo is superior to most latex semi-gloss paints, with the only exception being Sherwin Williams Superpaint, when you use straight white, as it has better hiding power. For stains, I prefer Minwax, because it is a known quantity. Most stain jobs out there are within their stain chart range. Most houses are built with preprimed wood on the trim. There is nothing wrong with this as long as you reprime it with oil primer. Preprimed wood has latex primer on it, which is weak, won't penetrate as well and will definitely fail wherever there is a knot, because the primer is not strong enough to back up the stain killer. For trim, I use preprimed pine, which is coated with latex on all 4 sides. I reprime the cut ends and exposed face with oil primer, for lasting durability, before painting them. For window sills, I use pressure treated wood, which is cost effective and provides the longest lasting results.